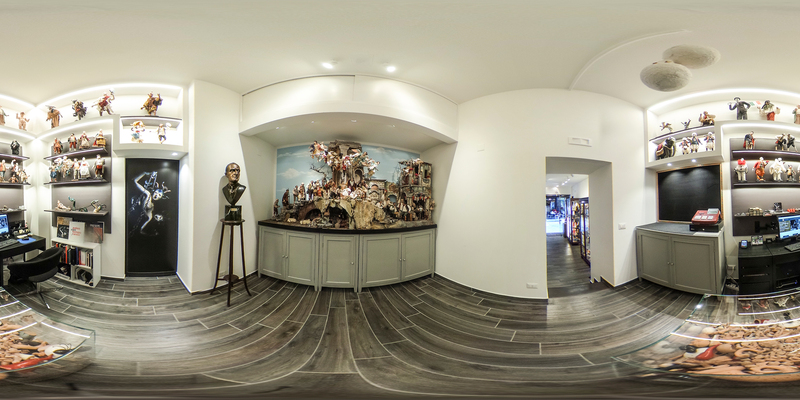 The traditional and contemporary finds space in Naples with the SCU8 collective, (so called by Roberto De Simone). Born in the second half of the nineties, thanks to the toil and ideas of brothers Salvatore and Emanuele (who graduated from the Accademia di Belle Arti di Napoli) and Raffaele, the group manager, plus also their collobarators. Craftsmen, artists, promoters of culture, the Scuotto brothers move between aspects of the cultural folklore of Naples and the need to undermine and update artisitic clichés, for example in their Nativity Scenes, finding inspiration in the squares and alleyways which are found around their workplace. Or else, reflecting on the nature of things, the emotional and functional narrative of objects and of art, as a possible means of communication, and a resistance to certain forms of cultural conformity. Their art is recognized in Italy and also abroad,thanks to the production of notable exhibitions, of which we may mention “Mostro….il Diavolo” in 2003, “Pulcinellarifavola” in 2004 and “Il mondo sospeso” in 2005, all held in the Church of San Severo al Pendino. Again, we should remember “Personaggi di terore, demoniac e magico-religiosoi della tradizione natalizia meridionale“, inside La Reggia Di Caserta in 2008, “SCU8 Maninarte” in 2009,edited by Luca Beatrice, at the Castel dell’Ovo and “Tradizione in Azione” of the same year, displayed in the Complesso di San Lorenzo Maggiore.2013 saw their organization and participation in “Paleocontemporanea“, a colloboration articulated in a trip between antique and contemporary artistic expression, developed by il Museo Archeologico di Napoli,il Museo e l’Osservatorio Astronomico di Capodimonte and the Catacombe di San Gennaro. In the same year they turned their attention to the Galleria Essearte, on the theme of reflections on the work of art, and most notably on the artistic promotion of the young. 2016 is the year of the operation “la terra in una stanza – the wunderkammer of the SCU8 brothers” permanently placed in the Gallery. They live and work in Naples.